This report has 3 pages (or tabs) and we're currently viewing the Store Sales Overview page. On this page are 6 different visualizations and a page title. Visualizations can be pinned to dashboards and when that pinned visualization is selected, it opens the report it was pinned from. Reports are a feature of Power BI service and Power BI Desktop. The experience of working with reports is almost identical. However, for mobile, you can't create reports but you can view, share, and annotate reports. Reports are based on a single dataset. The visualizations in a report each represent a nugget of information. And the visualizations aren't static; you can add and remove data, change visualization types, and apply filters and slicers as you dig into the data to discover insights and look for answers. Like a dashboard, but more-so, a report is highly interactive and highly customizable and the visualizations update as the underlying data changes. Dashboards are often confused with reports since they too are canvases filled with visualizations. But there are some major differences. Pinning Can pin existing visualizations (tiles) only from current dashboard to your other dashboards Can pin visualizations (as tiles) to any of your dashboards. Can pin entire report pages to any of your dashboards. Customization Can do things with the visualizations (tiles) like move and arrange, resize, add links, rename, delete, and display full screen. But the data and visualizations themselves are read-only. In Reading view you can publish, embed, filter,export, download as .pbix, view related content, generate QR codes, analyze in Excel, and more. In Editing view you can do everything mentioned so far and so much more. Depending on your role, you may be someone who creates reports for your own use or to share with colleagues. You want to learn how to create and share reports. Or, you may be someone who receives reports from others. You want to learn how to understand and interact with the reports. Here are some topics, by role, to help you get started. 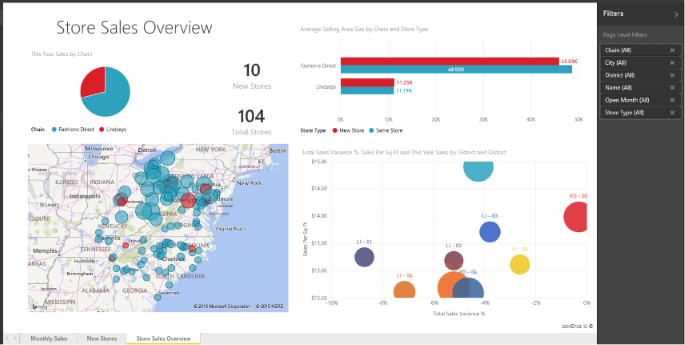 Start with a tour of Power BI service so you know where to find reports and report tools. Take a tour of the report editor. Learn how to create a report from a dataset. Discover all the different ways you can share a report with colleagues. Learn how to open a report and all the interaction available in Reading view. Get comfortable with reports by taking a tour of one of our samples. To see which dataset the report is using and which dashboards have tiles pinned from the report, view related content. If you didn’t find what you’re looking for here, use the Table of Contents to the left to browse all report topics.